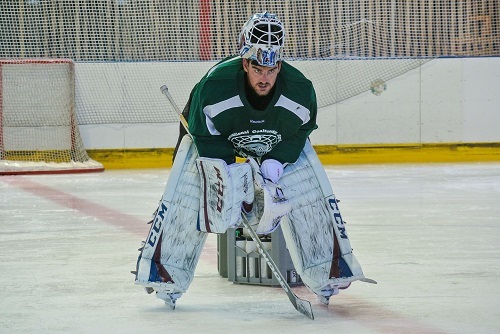 Eurolanche’s correspondent interviewed Colorado Avalanche goalie in Switzerland. City of Verbier in Switzerland is a famous location known for the ski tracks and its music festival. Just a few people know that this fraction of Bagnes (Valais) is also where it takes place one of the most famous training camps for professional hockey goalies in the world. 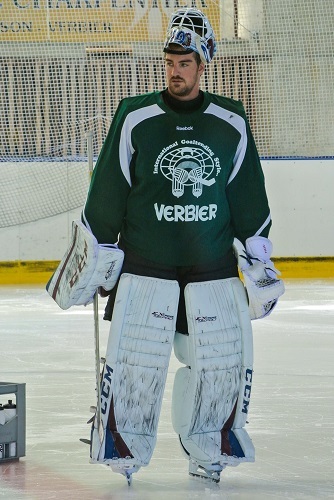 Every year a lot of goalies decide to start skating in Verbier after the summer break and one of these goalies is Reto Berra, who shared the backup spot with Calvin Pickard last season in the Colorado Avalanche net. Eurolanche’s correspondent/member and editor of the Heshootshescoores.com (hockey website in Italian language) Nicola Martinetti met Berra in person and interviewed him for the Eurolanche.com. It's not your first time at this camp here, right? Exactly, this is my fifth time. I like to participate and I find it extremely important. Every year here in Verbier it's the first time I come back on the ice after the summer break and that allows me to start move my body and feel comfortable again. It's like building the base of a house. We have a lot ice time (two trainings per day) and good coaches who follow us in every moment. How do you feel after the first half of the camp? The beginning of the camp it's always the most difficult and frustrating part. It always seems like anything is working, the equipment feels strange to wear, you can't find the measures of the net, the movements are too slow and the positions are wrong. When I was younger I was always angry because of that, now I learned that it takes time. But this year I already feel more comfortable than I usually do. The last regular season you started as Varlamov backup goalie and things worked out pretty good for you at the beginning. What happened next? I got an injury during a game in Ottawa, while things weren't exactly going well for us in the standings. Because of my injury (and Varlamov's one) Colorado called Calvin Pickard up and he played very well taking advantage of his chance and turning the momentum a little bit on his favor. When weeks passed and I still didn't play, the club gave me the chance to play a few games with the Lake Erie Monsters in Cleveland. Then, in the last games of the season, I had the chance to play in California, where I think I played pretty well. When Pickard took your spot and you didn't play a lot, what did Roy tell to you? How was he handling the situation? After almost a month that I didn't play he suggested me to go to Cleveland for five games and I absolutely agreed with this idea. In that moment, even if it meant to go down to the AHL, it was good to get some fresh air and gain some confidence and game pace again. I also scored a goal! It was an unbelievable feeling, I always dreamt to score! I already tried here in Switzerland, when I was playing for Biel, but I missed the net at that time. This time it was the perfect scenario. We were up 4:2 and there was only one minute left. One of the opponents shot the puck right into my glove and I had a little extra time to adjust it and take aim, this time hitting the target. In Cleveland you played with a Maxim Noreau, who played here in Switzerland for HC Ambrì-Piotta until last season. How did you see him? Do you think he is gonna have a chance to make it into the Avalanche lineup next season? I really think he can, already last season he was very close to make it. He is a defenseman with great skills and a good personality, he is an enjoyable guy in the locker room. Sadly when I was in Cleveland we played together only 2-3 games then he injured his shoulder, but he has for sure the potential to make the team. 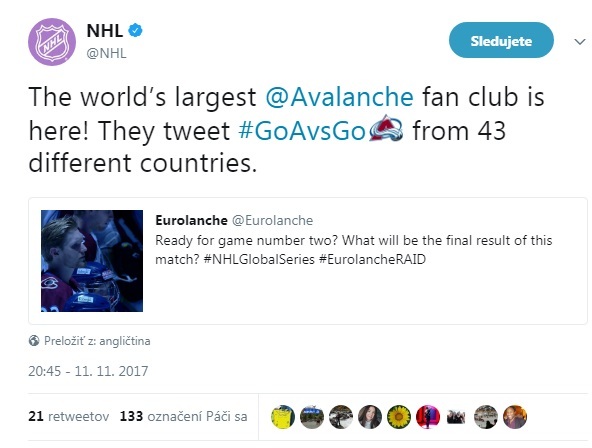 Last season wasn't easy for Colorado, it was the opposite of the 2013-2014 season where you guys won the Central division... How was the atmosphere in Denver? The atmosphere was pretty good, the fans never let us down and were really supportive. When things aren't working players are the first to get frustrated as well. We paid a bad start of regular season, while the second half of the tournament was not so bad. In the final part of the season we were still in the mix for a play-off spot and not dead last, so this is something positive to take. Play the season after an incredible year is always hard. People have higher expectations and we had a really young team with not enough experience to face it. I believe that this season was positive, we got experience from this negative side of the game and we learned how to manage situations where things are going bad, without giving up. You and Varly have a contract for the next season, while Pickard is still talking with the club as he is a RFA. If Calvin signs a new contract it seems like you and him are gonna battle for the backup spot in the October camp, are you ready? For sure, it's all what I can think about right now. I want to show my potential and convince the coach to choose me. Calvin Pickard who is here with you in Verbier... What is your relationship with him? We have a very good relationship. He and Varly are both extremely nice and I love to work with them and François Allaire in Denver, it's wonderful. During this market window a lot of backup goalies were traded to teams that needed a starter (like Cam Talbot from New York to Edmonton). Did you ever think about the chance to ask the Avalanche to trade you for this reason? I want to be a starter in the NHL for sure, that's my goal. Maybe a few backups in the NHL are happy to be in that position, but I am hungry. Trades are out of my control and the only things that I know is that I still have two years left in my contract with the Avs. I am going to Denver in October and I am gonna battle to earn the starter spot. Timo Meier was selected as #9 overall at this year's draft, Kevin Fiala as #11 last year and Mirco Müller as #18 two years ago. It seems like more and more Swiss players are earning a spot in the NHL, why do you think this is happening? This is great for Swiss hockey, which is rewarded for the good work made with young prospects. The key of this success is the fact that more and more young players are going in North America to play in the junior leagues, where they are observed by NHL scouts. When you play only in Switzerland as I did, your only chances to be watched by those scouts are the World Junior Championships or international tournaments with the first national team, but it's hard. Players like Meier and Müller played in the juniors in Canada and were under the radar of NHL teams. It's nice anyway to see more Swiss players in the NHL, I hope this can go on in the future. This spring you were part of the Swiss national team that played the World Champions in Czech Republic. How did you find the new Swiss coach, Glen Hanlon? Hanlon is a great coach and a nice person. He loves to be in contact with the team and he transmits us a lot of energy with his behavior. He is a really positive guy, he cheered us up after every match, even if results weren't good in the first part of the tournament. It was a pity to lose in the quarter finals against the USA, because I felt we had a chance to win that game. But this is sport, sometimes you win, sometimes you lose. Hanlon did a great job in my opinion.